"This recipe is quick to prepare and a great alternative for a lower-carbohydrate, lower-calorie option in place of a potato side dish. My husband is a meat-and-potatoes kind of guy and even he loved this recipe." Place spaghetti squash in a covered dish and add 1/4 inch of water. Microwave for 10 to 12 minutes. Scrape insides of squash with a fork and transfer to a small bowl. Heat margarine in a medium skillet over medium heat while spaghetti squash is cooking and cook onion, red pepper flakes, garlic powder, salt, and pepper until the onion is browned, 5 to 10 minutes. Preheat the oven to 375 degrees F (190 degrees C). Grease a baking dish with nonstick cooking spray. 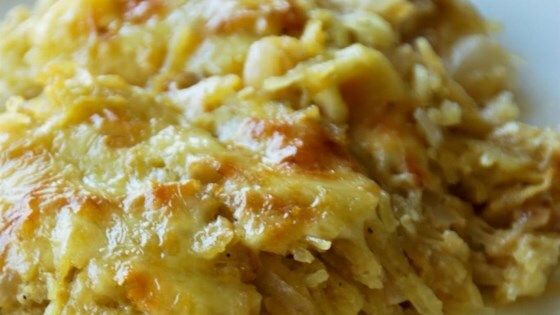 Mix spaghetti squash, onion mixture, sour cream, and 1/2 of the Cheddar cheese together. Transfer to the prepared baking dish and top with remaining Cheddar cheese. Bake in the preheated oven for 20 to 25 minutes. Turn on broiler for the last 2 to 3 minutes and broil until gratin is golden brown on top. A quick and easy way to prepare spaghetti squash. This is a great way to encourage your kids to eat more vegetables, although you may want to use a touch less red pepper flakes when preparing for them to lessen the spicy heat as it does have a bit of a kick to it. Yum! I followed the recipe exactly and it was delicious! I normally roast spaghetti squash in the oven but I used the microwave and it worked great. A nice change of pace! It was ok, but not really good enough to make again. Made this as written and will make it again. This is excellent and will certainly lend itself to creativity. My company didn't like onions so I replaced it with fresh garlic. Really good, creamy and tasty.